On Wednesday evening I had a call from my brother. He had just returned from visiting our parents in Cornwall and he suggested that I should go down and see them, like ASAP. Our mum has been ill for at least 20 years. She has emphysema due to a non tipped Player no 7 habit teamed with the fact that she worked as a machinist at the Chad Valley soft toy factory for ten years. Her lungs are pretty much dead. She spent year after year inhaling fluff off the teddy bears that are now collectors items on top of the self inflicted smoking damage. To her merit she did give up smoking when I was pregnant with No 1 son (who will be 19 at Christmas), but only after the doctor warned her that she would be dead within two years if she didn't. That all seems a long time ago now though and since then we have thought that we were going to loose her each and every year as the winter chills set in, her problems made worse by the super bugs that seem to be her best friend. Then earlier this year we found out that she had breast cancer. Due to the state of her lungs, surgery is not an option and so she went onto yet more medication to try to shrink the lump. This year the winter bugs hit her in June and she spent the whole summer in hospital whilst her grandchildren came and went as they do each year. They moved to cornwall nine years ago for the sea air and every summer since their place has been a hot bed of family visits. Mum and dad love having the kids around and I do often wonder if they did the right thing by leaving us behind and moving on but they have made a happy new life for themselves in a beautiful part of the world. Her summer spell in hospital has not been good for her state of mind - but then who would enjoy being stuck in what is officially the worst hospital in the UK whilst the sun is shining and the birds are singing? So when I had the call from my brother last week I felt terribly guilty for not being in touch as much as I should and also a little worried that I wouldn't ever see her again. As it was our half term I decided to take the children down to see her. 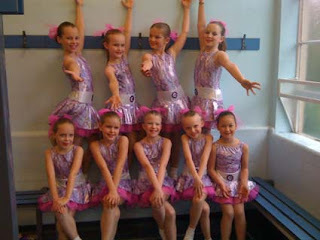 FunnyGirl had a dance festival the following day but we could leave after that and be there for bed time. FunnyGirl was amazing as usual, in fact all of the kids in the Junior group were amazing. Their first performance together and after just six rehearsals they took the Silver Medal. Another proud parenting moment. She is bottom right, seated in the picture and at least 4 years younger than everyone else in the group. Off we went in my little Mini, packed to the rim and bursting with lots of stuff that we didn't really need - but I am not used to being the long distance driver. Yan always drives and I always tweet and sleep and by the time we hit the torrential rain in Bristol I was wiped out. And I knew that I had at least two hours work to do before I went to bed. After a family discussion it was decided that we would stop at the next services, sleep in a hotel and set of first thing in the morning. A Travelodge...... what joy of joys?! Now, we have stayed in some pretty swanky 5* hotels in Thailand, so I have to ask - Why, oh why, oh why did they find that manky Travelodge (without even a bar of skin striping soap) so exciting? They all went straight off to sleep and I got on with the editorial that I had to write. I must add at this point that I HATE the fact that hotels rip you off with their internet access fees. £10 for 1 hour! Thankfully I had my dongle, but it really gets to me that they charge for wireless access. Just put the price of the room up and be done with it. So the rest of the outward journey was un-eventful. The kids had a great time. Dad says that our visit really cheered mum up. 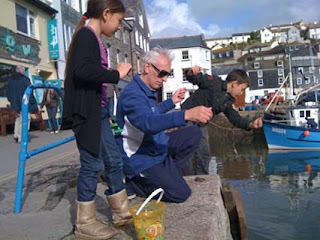 We had fish and chips and crabbed of the harbour in Mevagissy (an essential in any seaside visit for us!). Friday was home time. I wanted to leave early ish as I was going to see Morrissey in Birmingham that night. Was I excited? had I been waiting since the gig was cancelled in May? Yes, Yes. Well we didn't leave early - mainly due to fact that the girls spent far too long on the jewellery stall at the antique fair that we visited but hey ho. So we left Cornwall at 11.20am. Journey time home on a good day is four hours, leaving me plenty of time to get showered and changed and off to the gig. 3pm - not even reached Bristol. Stuck on the M5, road works and accidents have us at a standstill. 4pm - still not reached Bristol. 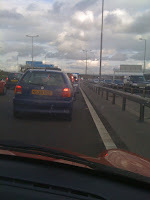 6pm - I come off the M5 at Evesham due to sign saying more congestion on M5 due to another accident. Problem.... everyone else decided to do the same thing. Now this road is at standstill. 6.30pm - Loosing the will to live we decide to sing Morrissey songs until we get home. 6.35pm - Battery on iPhone dies. Perleeeeze - I just want to get home! We go another way..... we arrive home at 7.45pm. Journey time 8 hours and 25 minutes - an actual record!!! I really am going to give up travelling now. I hate it. Oh my, I'd have been going crazy! I don't think it's ever taken us that long to get from Gatwick up to Whitby when we fly in there for our hols! How did you manage loo breaks? My Mum lives in Cornwall and we had the same problem! Left at 11am didn't arrive until 7.30pm :( No fun with two toddlers! !